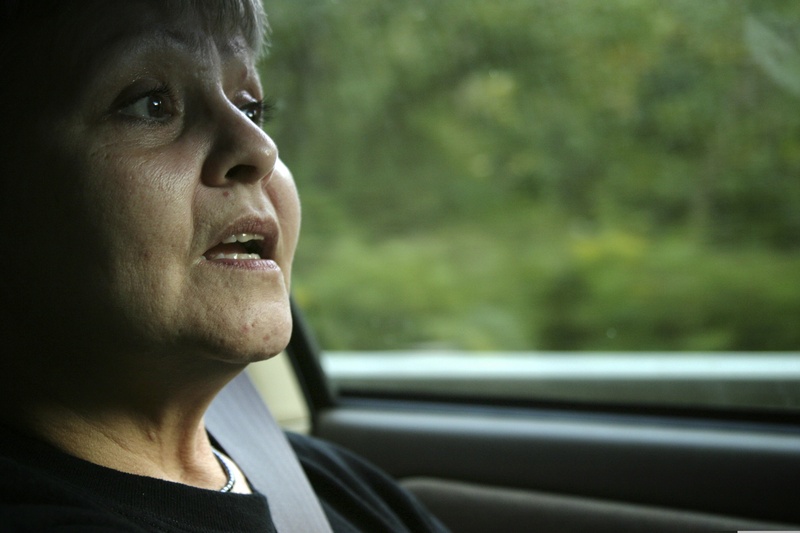 The former Pizza Hut manager and grandmother became an activist through what she called a spiritual awakening. The moment of epiphany was one she described frequently in interviews and from behind a bullhorn or microphone at speaking events. It was the moment when she realized the imminent danger of the waste ponds holding MTR by-products of sludge and debris that were harbored on the ridge above her home in Marfork Holler. 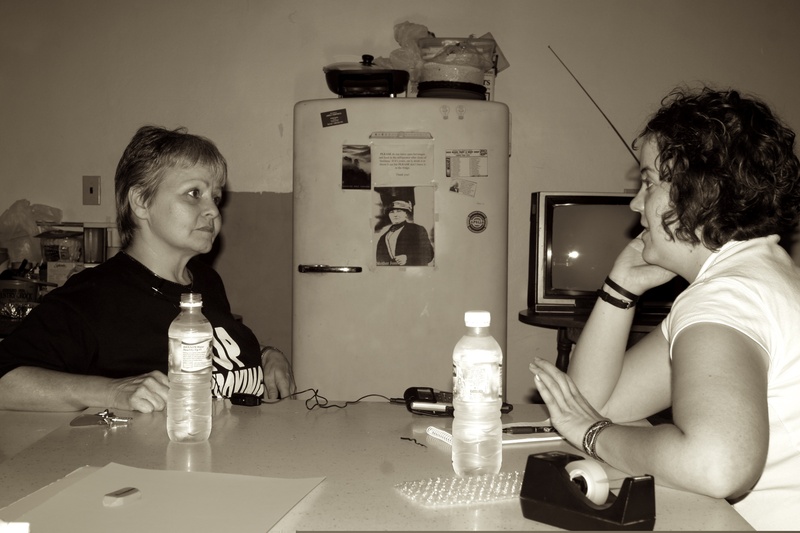 Judy Bonds (left) is interviewed by Beth Newberry (right) at Coal River Mountain Watch Headquarters. Photo by David Flores. In 2004, Rose Berger, associate editor of Sojourners magazine in Washington, D.C. assigned me to profile Bonds about her activism and her (at that point in time) little-documented faith life and religious convictions that offered the framework to her beliefs and actions. As I researched Bonds in preparation for my trip from Louisville, Ky. to Whitesville, W.Va., with friend and photographer David Flores over Labor Day weekend, I realized that I had met Judy Bonds previously. Judy Bonds explains the process of Mountain Top Removal (MTR) coal mining with a model. Photo by David Flores. When I met her again in 2004, her directness and clear spoken nature had not dissipated. In our eight hours together that day, our conversations illuminated how critically Judy understood her purpose as a community activist and as a Christian. To Judy it was the environment and God’s creation that was at stake; it was her family’s lives that could be lost, and it was economic viability and clean water that were quickly disappearing. Her small stature was made bolder and grander by her focus and her well-chosen words. Gray strands peppered her dark hair. Her face could have been mistaken as cherubic with round cheeks and a piercing light in her eyes—but that would make her out to be demure or reserved when she was anything but that. David and I visited Whitesville just weeks before John Kerry and George W. Bush faced off in the presidential election and days before Kerry was due to visit the area for a Labor Day picnic in Racine. Later in the day on our drive through Raleigh County, Kerry/Edwards political signs and American flags speckled the green, grassy roadsides. We all know how that election turned out. But on that warm, early September day we visited Judy, it seemed that the election and Kerry’s visit could really be a precipice for change on environmental policy in central Appalachia. She was hopeful that if Kerry was elected, his policies might put the brakes on the Bush administration’s dismantling of protections on valley fill permitting— the process that regulates coal companies ability to fill valleys in the hills with unwanted materials unearthed in strip mining. “Bush streamlined the permitting process. He turned it into a waste-permitting process,” Bonds says. Bush’s re-election has put her and other activists on guard for the struggles ahead. “Some people say that the inevitable blatant destruction of God’s creation, our environment—the poisoning of our children—will make more people realize how important it is. They say we have to hit rock bottom before we can learn from our mistakes. I fear that most of our water and air will be polluted beyond cleansing by anyone other than God if we all cannot rise up to fight this,” she said to me in our conversation published in Sojourners. David Flores, who contributed unpublished photos from our trip in this issue of The HillVille in the article “A Day with Judy Bonds,” said Judy was unlike others in the news at the time who were focused on shaping the election and campaign promises to their own benefit. “[She] looks at what she owes the world and can do for other people,” he told our editors at Sojourners. When she died, Judy had accomplished many things, including her instrumental efforts in building a new elementary school in Raleigh County, which would be out of the way of a slurry dam of coal waste. She raised awareness across the U.S. about the destruction of the mountains and empowered citizens and students in the fight against MTR. And maybe most remarkably, she embodied peaceful resistance in face of threats, violence and intimidation. She stood up and spoke out for what she believed was the best for the future of her kin and community—clean water, green jobs and God’s creation. Judy Bonds gives a driving tour of Whitesville, W.V. Photo by David Flores. When I heard Judy had passed away last January, I thought of birds in the backyard of the home she moved to after moving out of Marfork Holler and of the solace and renewal they gave her. I knew from the day we spent together that she believed in Heaven, and I imagined that for her Heaven would be a return to Marfork Holler with the sight of birds rounding the clouds above. This is one of a three part series of our tribute to the life and work of community activist and outspoken mountain mama, Judy Bonds, who passed away a year ago this week. Read Bonds’ friend and brother in the fight against MTR, Jason Howard’s, “Appalachia’s Patron Saint,” tribute to her life and legacy or view the photo essay of Judy Bonds in her hometown. Read more about Coal River Mountain Watch, the organization Judy worked with as outreach coordinator for many years.